Whey Protein 80 SF+ is a ground-breaking whey protein powder, formulated exclusively from premium grade whey protein concentrate and guarantees unparalleled levels of purity. What makes Whey Protein 80 SF+ so unique is that it's manufactured using sunflower lecithin, instead of the commonly used soy lecithin. The result is a next-generation pure whey protein, ideal for anyone looking for a totally soy-free whey protein shake. Not only is Whey Protein 80 SF+ the UK's first whey protein shake with no added soy lecithin, it is also created using TPW™ acclaimed natural flavours and colours, making it the purest whey protein on the market today. Finally, it is undenatured and micro-filtered with no thickeners or fillers. Serving size: 25g (one grey scoop) of Whey Protein 80 SF+. 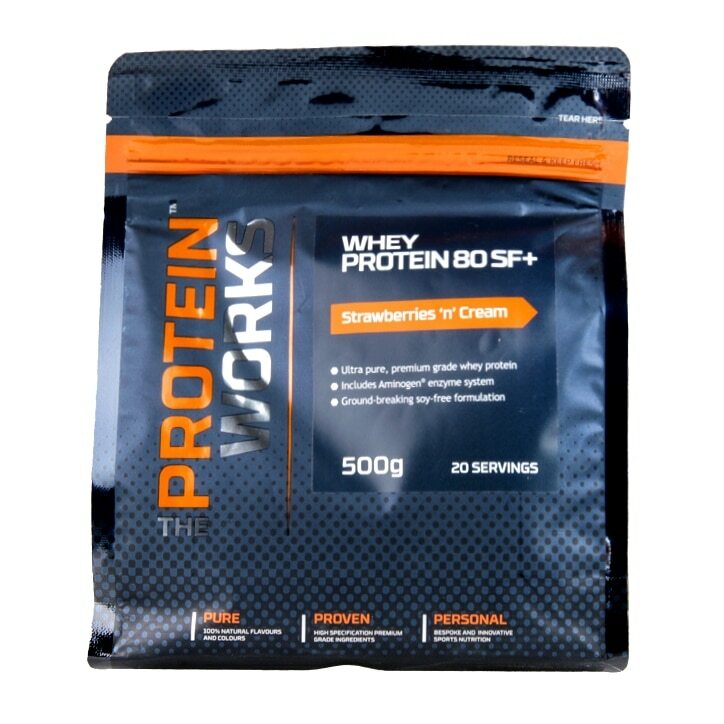 We recommend between 3-5 servings oer day of Whey Protein 80 SF+. Depending upon your own individual needs, it is widely recommended that for optimal benefits, you should take 1 gram of protein per pound of body weight per day. Add 150ml-225ml of water or milk into your TPW master blender. Add one grey scoop (25g) of Whey protein 80 SF+, Mix well and drink. The less liquid you use, then the thicker your shake will be, so adjust to suit your own taste. Undenatured Whey protein concentrate (milk), Natural flavouring, Natural Colouring (Beetroot Red), Aminogen, Sweetener (Sucralose), Sunflower Lecithin. The Protein Works Whey Protein 80 SF+ Strawberries 'n' Cream is rated 5.0 out of 5 by 1. Rated 5 out of 5 by RBLondon from Best protein powder I've tried Best protein powder I've tried. No aftertaste. Not at all grainy.